This is another card made with Pony Party and its complementary wheel, Dreams. I’ve made this ready-to-go for one of my daughter’s school friends, just so I can avoid my usual making a card at the last minute! 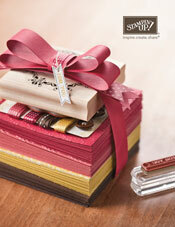 Do you prepare ahead or are you a last minute stamper? 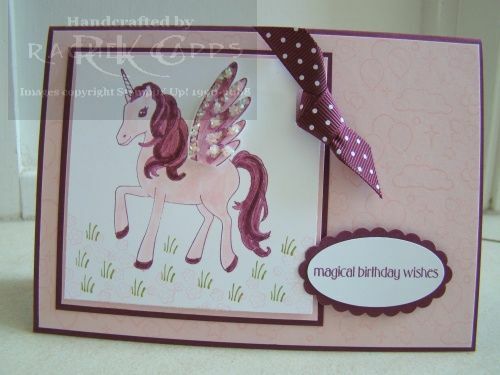 I used the colours Rich Razzleberry and Pink Pirouette for this card. I stamped the pony in Rich Razzleberry and then used a blender pen with the Pink Pirouette ink pad to colour in the pony (and the same for the pony’s mane, tail and hooves in Rich Razzleberry). I stamped the grass with Old Olive and I wheeled Dreams in Pink Pirouette on Pink Pirouette paper for a subtle tone on tone effect and background. 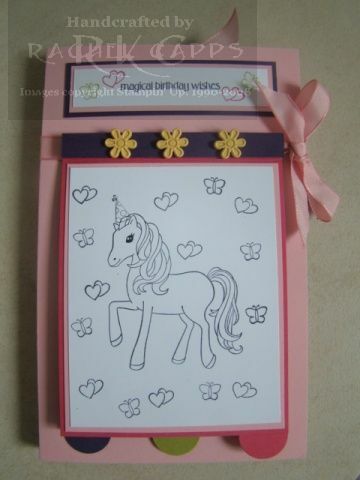 And for a touch of magic – some white chunky sprinkles are stuck to the pony’s wings using Tombow glue. I’ve used the Scallop Oval punch and layered over it the large oval punch with the sentiment stamped in Rich Razzleberry. The ribbon is the finishing touch! Wow! I can’t believe I haven’t blogged since Convention – sorry!! I admit, I’ve been exploring the land of Ballivor (where the novel I’m writing is set) and the politics have hit a hiccup (much like Aussie politics at the moment, yeah?) so I’ve tucked my novel away for a little while as the pot needs to simmer. In the meantime, I’m making again! If you have a little girl, you’re a stamper, and you haven’t already bought Pony Party, then I hope this card inspires you to purchase it! Because little girls LOVE Pony Party!! Well, at least my daughter does, lol!! And this is a super idea. This card was inspired from a Convention swap – you can see Lisa Jansen’s original card here (look for her entry on 21 May 2010). I really admire Lisa’s clever idea (thanks, Lisa! ), so I had to make it and share it. I made this card last week for my lovely friend’s daughter – Madison. Happy birthday, Madison! I started with a base colour of Pretty in Pink, and I’ve also used Melon Mambo, Kiwi Kiss and Elegant Eggplant. 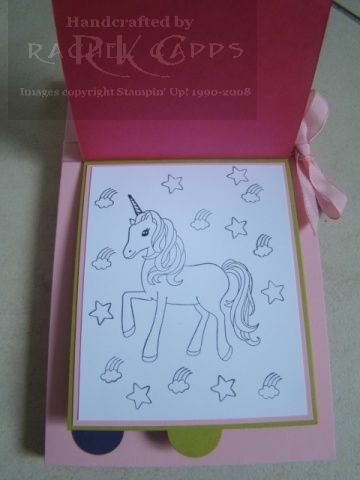 I stamped the first easel with the pony in Staz On black ink – and I’ve stamped it three times (see below), so that Madison can colour the card as she likes. 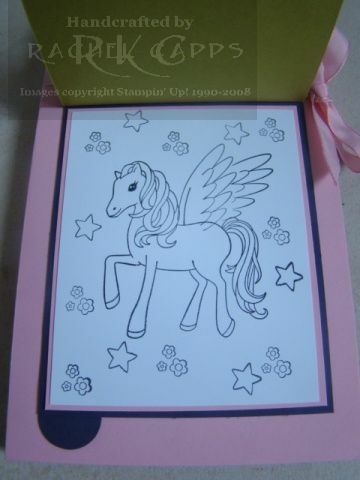 And on the inside of the card, I made a little box to slip in the crayons Madison can use to colour in her ponies. 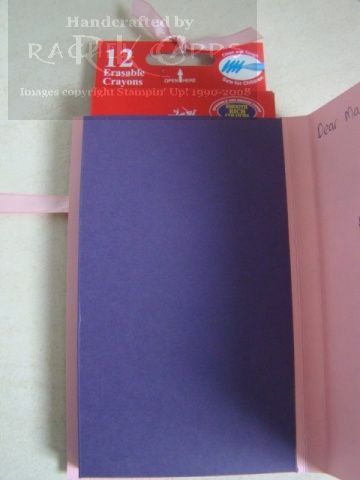 And the card is finished off with some Pretty In Pink tafetta ribbon. I hope you like it!